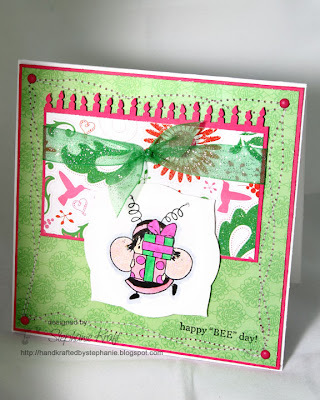 HandKrafted by Stephanie: Happy "Bee"day, Mom! First off, I want to wish my sweet mom a VERY HAPPY BIRTHDAY! I made this card for her. I started off using a sketch, but then I veered from it so much that it ended up being not even close to the sketch. My mom loves to watch the hummingbirds feed and chase each other around. She has a couple of feeders in her yard and has to refill them every few days as she has a very loyal following. I mean, who wouldn't come back daily to feast on homemade nectar? I started off searching in my stash for patterned paper with hummingbirds on it. I found it in my spring stack. It was a little brighter than I had intended the card to be, but I went with it. Hopefully it doesn't blind her. I hope you have a great Easter weekend! Thanks for stopping by! Accessories: Labels Three (Spellbinders), Cuttlebug (Provo Craft), Markers (Copic), candles border punch (EK Success), Star Dust stickles (Ranger), tiny rhinestones (CTMH), brads, ribbon, foam tape, thread, sewing machine. Totally adorable! Your mom will love it! That candle edge is too cute! Have a great Easter!